Our Fire Performers in Dubai can bring an exciting and entertaining performance to your event. We have male and female fire artists who can show some amazing tricks with their equipment. Such as, body burning, fire eating and fire breathing. They can freestyle fire or choreograph a routine. Our Fire performers have mastered the art of fire through years of experience. With a multitude of acts, they can certainly make your event an unforgettable one. Most equipments include fire poi, fire fans, fire sticks, fire hoop, fire sword, fire jugglers and fire umbrella. In addition, they can perform breathing tricks, fire eating and body burning with their equipment. We can create mind-blowing fire shows for corporate events and private parties with a number of performers. Also including choreography to any music of your choice. For nightclubs and beach parties or even an entrance to your event, we have performers who can freestyle. Ancient Aztecs performed a fire dance dedicated to the god of fire. In certain countries around the world, the Angel Dance and Fire Dance is performed regularly for tourists. These 2 dances originated in a trance ritual called the sanghyang, a ritual dance performed to ward off witches at the time of an epidemic. 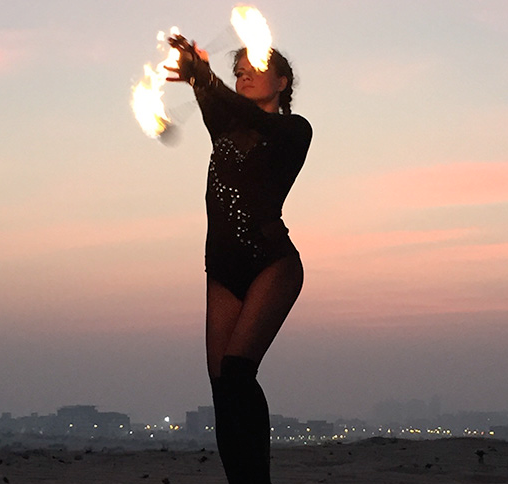 Since the mid 90s fire performers have grown in popularity and are often seen performing at nightclubs, beach parties, corporate events and festivals.